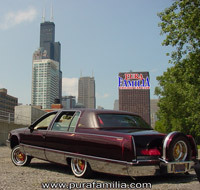 Vehicle: '93 Cadillac Fleetwood - "Pimp Juice"
Chicago's finest Cadillac doesn't have to slap the competition to get the respect that it deserves. Rene and David Espinoza of Chicago, Illinois, are a good example of how strong family bonds and especially brotherhood are in the lowriding game. Rene and David own a couple of restaurants in Chi-town and rely on the love of their parents and loved ones to support the family business as well as their addiction to customizing luxury low-lows. The story of the "Pimp Juice" '93 Cadillac Fleetwood starts with David purchasing the car from a friend. Once Rene got involved in adding wire rims to the Caddy, the customizing bug pumped its venom into Rene's bloodstream. David asked his brother if he could take care of the project while he was on vacation for two weeks. Rene started by getting the car painted candy brandywine. "I told David that I wanted to put a mural on the car and he said fine," reports Rene, "so I put my face on the hood (ha-ha)." After Rene had muralist Martin Pozo airbrush his face on the hood surrounded by some fine ladies, David decided that his former daily driver should belong to his brother so he handed over the keys and pink slip to the car. The vehicle was then transformed from an ordinary street ride into a masterpiece that cost more than $30,000 to build. Big things began happening to the "big body." The interior is sure the center of attention with a custom fiberglass center console that's connected to a custom rear deck fiberglass speaker box that covers the entire rear window. Once the car was on the verge of being finished it needed to get juiced so the frame was reinforced to give it extra support. The frame was smoothed out and candied over to match the body. The trunk is like a jewel box with one of the best hydraulic setups ever seen in Chicago. Gold, chrome and candy paint make the trunk's contents really stand out. Rene would like to give special thanks to his brother David for not tripping when the car was taken from him. 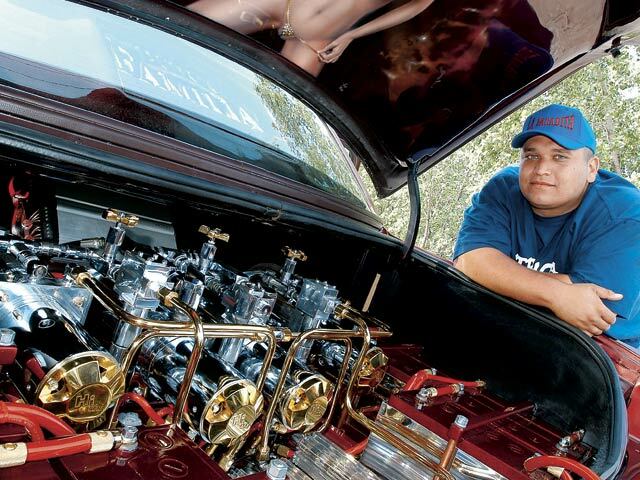 Rene would also like to extend his thanks to his wife for putting up with his addiction to lowriding, as well as his parents and all of the members of Pura Familia Car Club for standing strong. 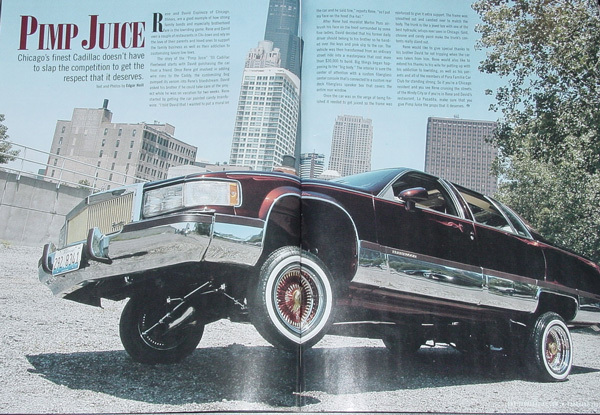 So if you're a Chicago resident and you see Rene cruising the streets of the Windy City or if you're in Rene and David's restaurant, La Pasadita, make sure that you give Pimp Juice the props that it deserves. Edgar throwing down with his camera! The perfectly good stock engine was pulled out and replaced with a Chevy 350-c.i.d. that was accessorized with custom air cleaner and headers, and all-chrome pulleys and valve covers. The engine work was done by Rene, David and fellow Pura Familia C.C. members. The engine bay was also painted to match the car. The Cadillac had minor bodywork done. Some of the parts were shaved, including the back doors, hood and trunk. 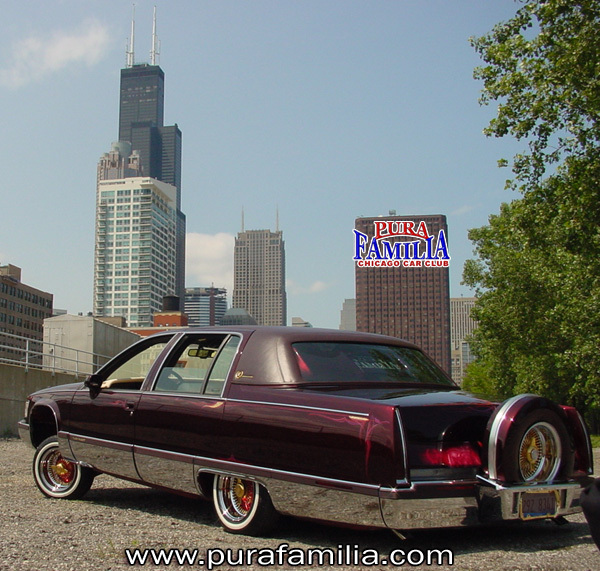 The cars was sprayed candy brandywine by Orlando of Creator in Chicago. After the car was painted, murals were sprayed on the hood and trunk by Martin Pozo at Creator. The interior is one of a kind. The original seats were replaced with custom-cut bucket seats and reupholstered with pillow tucked sandstone leather. Orlando did the upholstery at Orlando's Glass and Tops in Chicago. A custom fiberglass center console extending the entire length of the interior was fabricated, as was a fiberglass woofer box covering the rear deck and window. An Alpine head unit is joined by Alpine tweeters and mids, and powered by a full rack of JL Audio amps. Dan "Loco Lugo" at Chi-town's Pro Sounds took on the intense job of manufacturing the audio-visual system. Rene also has a back-up camera neatly placed inside the Continental kit with the image displayed on any of the several flip-down Alpine monitors. The body was taken off of the frame and wrapped to be able to support the abuse of hydraulics. Extended A-arms and boxed lower arms help the car stay stable. Mario at Switch Happy in Chicago took on the task of reinforcing the frame. Bob "Hollywood" Wagner at Hollywood Kustoms in Northlake, Illinois, installed the setup that includes four chrome and gold Hi-Low pumps, four Adex chrome dumps, 8-inch cylinders in the front and 14-inch in the rear, 16 solenoids, 10 candy-painted batteries and five switches to control the hydros with the juice being pumped through 24K gold-plated hardlines.